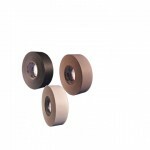 Gaffers tape is a cotton cloth tape with a matte vinyl finish. The tightly woven cloth means that the tape is strong and tears straight every time. The vinyl finish is not shiny and means that the tape doesn’t reflect light. This tape, unlike less expensive duct tape, uses a specially formulated synthetic rubber adhesive that is designed to be be removed without leaving an adhesive residue. The combination of a vinyl coating and high quality adhesive means that gaffers tape is water resistant and able to be formed in a tight and conformable seal. Gaffers tape can be written on with a felt tip or Sharpie Marker which makes it a useful labeling material. Made in many colors, this tape is useful for color coding. Those who work in film and video value the matte finish of gaffers tape which can make it almost invisible on stages and sets. The strength of gaffers tape make it a valuable repair material for repairing bus seats and other vinyl surfaces. Gaffers tape is made in large (wide) rolls and then slit to width, meaning that it can be offered in many widths. The standard width is 2 inches, but widths as narrow as 1/2 inc (spike tape) are common.